An ode to the oddball of our solar system. The best planet in our solar system is not, as Adrienne LaFrance claimed several months ago, Jupiter. Nor is it Saturn, as Ross Andersen argued in a rebuttal last month. I teach science for a living, which means I have a hard time allowing misinformation to pass by uncorrected—and after reading those articles, I knew I had to step in before any more intellectual damage was done. The best planet is Uranus—Uranus the bizarre. 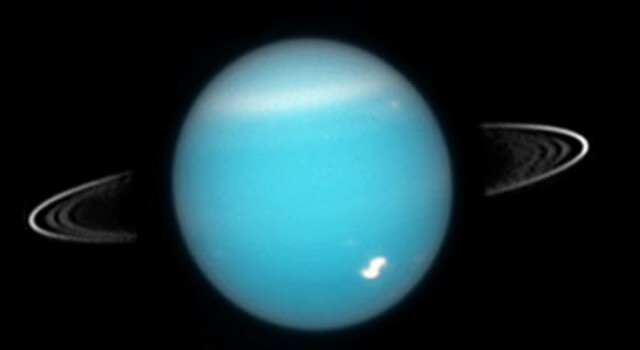 Uranus the unique. 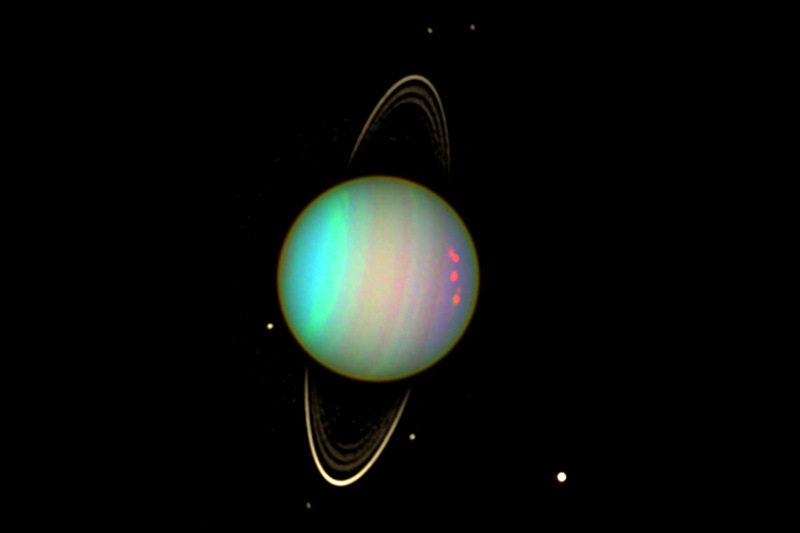 Saturn may be flashy and pretty, and Jupiter may be huge and dramatic, but they can’t hold a candle to Uranus’s intrigue. While all the other planets spin like tops around the sun, Uranus lies on its side. It isn’t the farthest planet from the sun, yet it manages to be the coldest. Its magnetic field is nowhere near where it’s supposed to be, and its ghoulish blue-green atmosphere seems to alternate between dull stagnation and fits of activity. Even its name is unusual. Uranus is the only planet with a name derived from a Greek deity, rather than a Roman one. Correctly pronounced “YOOR-uh-nus,” it’s an homage to the Greek god Ouranos, Father Sky—who, it bears noting, is the father of Cronus (Saturn), and the grandfather of Zeus (Jupiter). The more astronomers studied this new planet, the clearer it became that it was an odd one. Consider the seasons on a world turned sideways: Summer on Uranus is two decades of non-stop sunlight, and winter is an equal amount of time spent in total darkness, facing the cold void of distant space. Day and night only exist during spring and fall, where they cycle every 17 hours. Some have suggested that the planet was knocked askew by a gravitational tug-of-war with a large moon that has since been lost; others have proposed that it was the result of a collision with a massive object (much larger than Earth), or even multiple collisions. This strange posture is just one on Uranus’s list of mysteries, a list that also includes its temperature. While the other gas planets are still slowly radiating out the heat of their formation, Uranus generates hardly any internal heat at all. No one is sure why, but that lack of heat may be the underlying cause of the planet’s extreme atmospheric temperatures: Deeper cloud layers get as low as 360 degrees below zero, colder than any other planet in the solar system, and yet the outer-most layer can reach more than 500 degrees, far higher than any other gas giant. Like Jupiter and Saturn, Uranus’s atmosphere is full of hydrogen and helium, but unlike its larger cousins, Uranus also holds an abundance of methane, ammonia, water, and hydrogen sulfide. 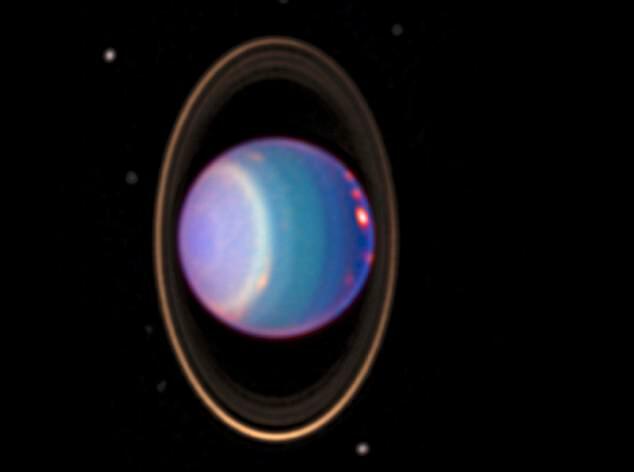 Methane gas absorbs light on the red end of the spectrum, giving Uranus its blue-green hue. If you were to fly down through the layers of the atmosphere, the surrounding clouds would grow denser and denser, colder and colder, bluer and bluer as the gases absorbed more of the visible spectrum. And deep below the atmosphere you may find the answer to yet another one of Uranus’s big puzzles: Its unruly magnetic field is tilted 60 degrees from its rotational axis, much stronger on one pole than the other, and shifted a few thousand miles off-center. Some astronomers believe the warped field may be the result of vast oceans of ionic liquids hidden beneath the greenish clouds, full of water, ammonia, or even liquefied diamond. Perhaps Uranus wouldn’t be quite so mysterious if more spacecraft stopped by—but while Mars, Jupiter, and Saturn seem to receive a constant stream of high-tech fan-mail from Earth, Uranus has only been visited once. In 1986, Voyager 2 swung by on its way into deep space. It was the first and so far the only mission to get an up-close view of Uranus, and what the probe saw was, at first glance, dull. Voyager 2 observed little atmospheric activity, and few cloud formations. For a moment, it seemed the icy clouds held little of interest. But it’s been 30 years since the Voyager fly-by, and we’re wiser now. When Voyager visited, Uranus was just about at its solstice—the South Pole was almost directly facing the sun, and its North Pole was turned away. But as Uranus continued along its slow orbit, the seasons changed, and the northern hemisphere slowly came back into the light. In 2007, Uranus reached its equinox, the time when the equator faces the sun and the hemispheres receive equal sunlight. According to Imke de Pater, a professor of astronomy at the University of California, Berkeley, the earlier observations of Uranus were “nothing like what we’ve seen during the Equinox.” Over the past several years, astronomers have witnessed winds that blow hundreds of miles an hour, massive storm systems persisting for hours to years, bright cloud patches that migrate across the planet, and “dark spot” storms similar to the famous Neptunian version. And then there are the moons, which, like Uranus itself, bear unusual names—most moons in our solar system inherit their names from Greek mythology, but Uranus’s moons come from English literature. There’s Umbriel, strangely dark except for a mysterious bright band; Oberon, covered in craters and one very large mountain; Miranda, scarred by cracks and fissures so extreme they put the Grand Canyon to shame; and two dozen more. When describing the motion of Uranus’ moons, Showalter uses words like “random” and “unstable.” The moons are constantly pushing and pulling each other gravitationally, which makes their long-term orbits unpredictable, and over millions of years some are expected to crash into each other. In fact, at least one of Uranus’s rings is thought to be the result of such a collision. Learn enough, and it’s impossible to not be entranced by the beautiful chaotic dance of Uranus’s ring and moon system. Hidden among those strange movements may be the keys to understanding the unusual gravitational interactions of bodies across the cosmos. So why not take a closer look? Astronomers have considered sending an orbiter to Uranus, but there are complications. For one, Uranus is incredibly far away, between 1.5 and 2 billion miles from Earth. Besides that, Uranus is hard to predict. We don’t know what to expect from the fluctuating temperatures of the planet’s upper atmosphere, and while the chaotic motion of the moons is too slow to threaten a spacecraft, there’s reason to suspect we haven’t yet spotted all of the moons and debris orbiting the planet. “What I’d really like to do,” says Glenn Orton of NASA’s Jet Propulsion Laboratory, “is get a probe into the atmosphere.” There, astronomers might be able to start unraveling some of Uranus’ most enduring puzzles: the deep structure of its atmosphere, the cause of its off-kilter magnetic field, and perhaps the reason for its frigid internal temperatures. Until then, we can only gaze at the planet across 2 billion miles of space, guessing at its secrets. The best questions in science are the unanswered ones, and the best planet in the solar system is seventh from the sun, shrouded in methane and in mystery.